Another Early start! We’ve been getting up about 6:30am and then at the end of each day, start to feel sleep coming on around 8:30-9:00pm. Being not much of a morning person, it’s been an interesting ride for me! We’re all getting a little loopy. Gary and I have boat hook fights as we stand at the lock. Kris and Spinny started playing dress up….well, dress up Spinny that is! We booked it all day, hoping to get through the locks and over to Waterford. We didn’t make it though. 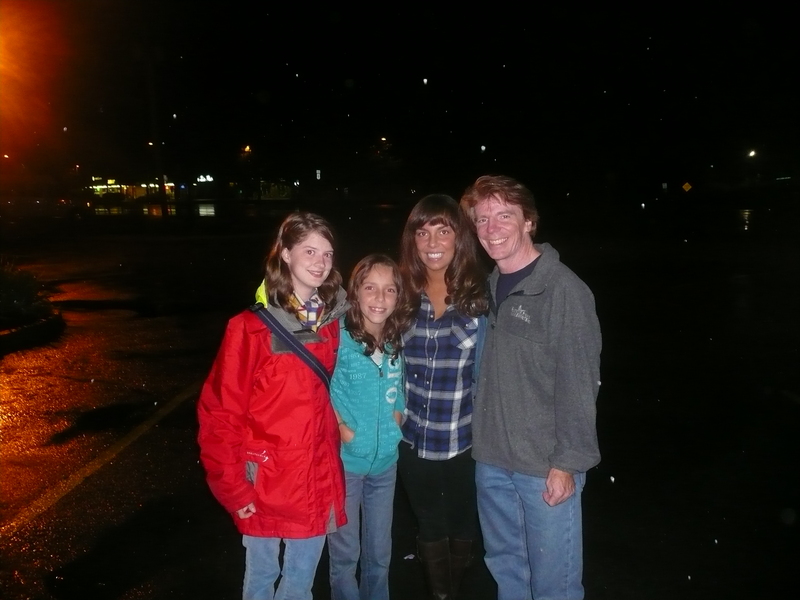 On top of that disappointment, it was a dreary, rainy day all day and it got worse as the day went on. 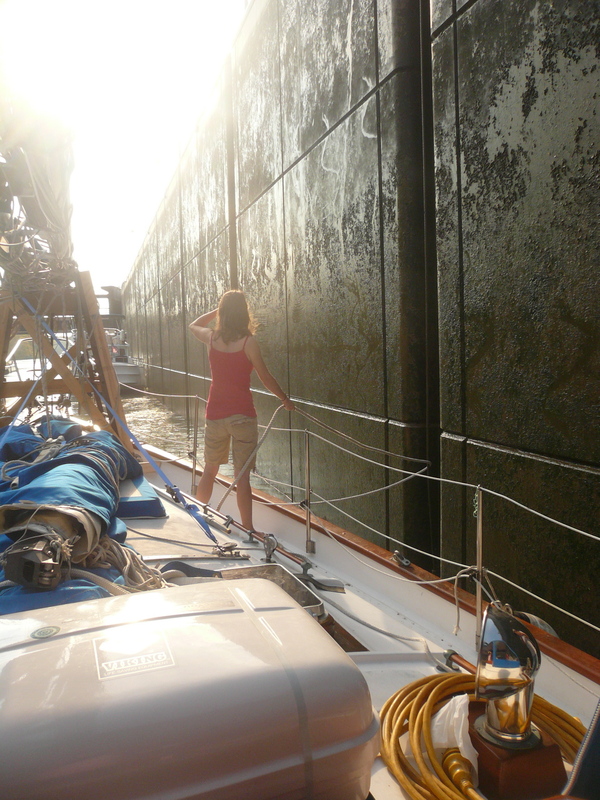 We had to tie up on the Crescent Terminal Wall near Half Moon (named after the Dutch vessel). Kris and I found a grocery store nearby on the I-Phone GPS and decided to bike over to get some groceries for Carol. The rain didn’t let up. 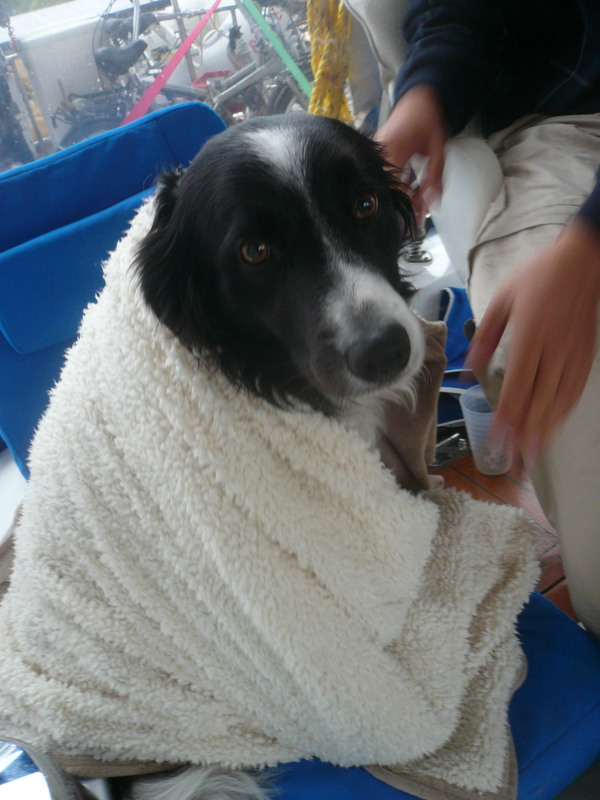 Equipped with sailing raincoats as we were, we still became damp and tired. It was all worth it in the end though when Kris and I sat down in the boat and drank hot apple cider while playing Monopoly and we all had a delicious dinner of baked acorn squash and apples with slow cooked ribs. Yum! For dessert we had a visit from Emily’s New York relatives – Steve, Allison, and Bitsy (Elizabeth). Bits and Spinny became fast friends. After a tour of the boat, the NY Eskers took Kris and I to the Half Moon Diner for some pie. Mmmm, delicious! 333 miles down the Erie Canal, only 7 miles left! Another early start on the canal. 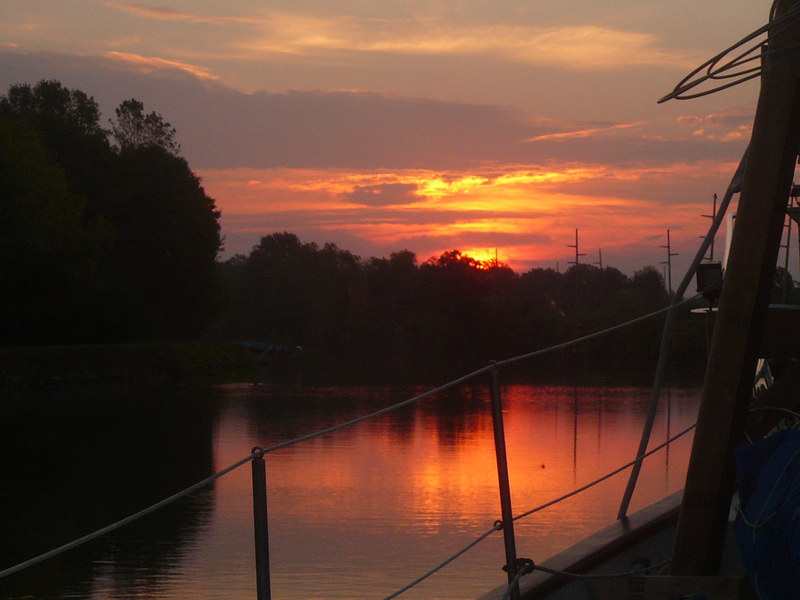 On to lock 22 as a beautiful sunrise met our eyes. All was quiet on the canal for a while until – BOOM! BOOM! Cannon shots! Some kind of historic battlefield reenactment or camp or the like was to our right. We could see the cannon smoke through the trees. Poor Spinny ran down into the cabin! 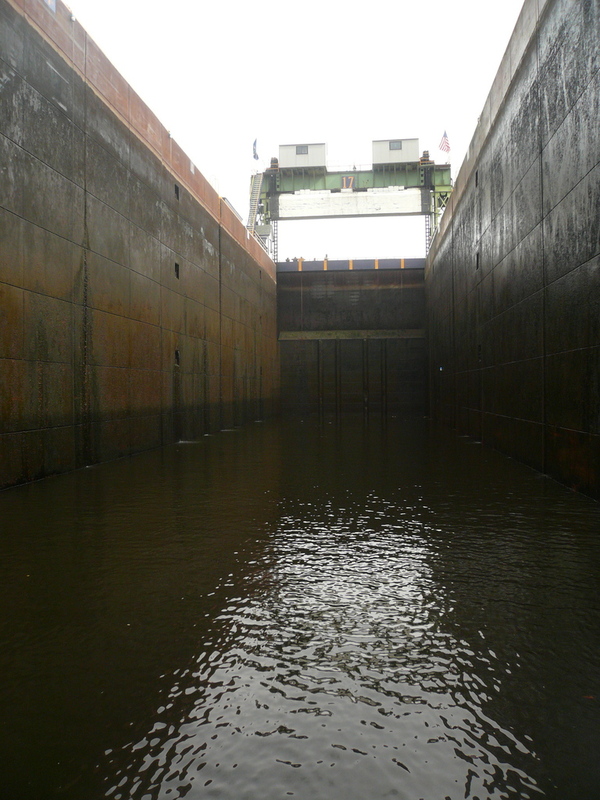 We went through the largest lock on the canal today – Lock 17. Instead of swinging doors at the end, they had a lifting door with a giant counter weight. The drop was 40.5 feet. The walls were spilling water out of them. This was not only the largest, but the leakiest lock we’d encountered! When we went under the lock door, water was dripping down. Kris, manning the wheel as usual, tried to zip everyone out of the cockpit cover and force us to get wet. I forced my way in, but Carol and Gary didn’t make it. The leaky lock got them. We stopped in Canajoharie, the location of the Beech-Nut factory as well as several beautiful old buildings. Kris and I came across the home of Mr. Wagner, the inventor of the Sleeper Car and Palace Car for the train lines. 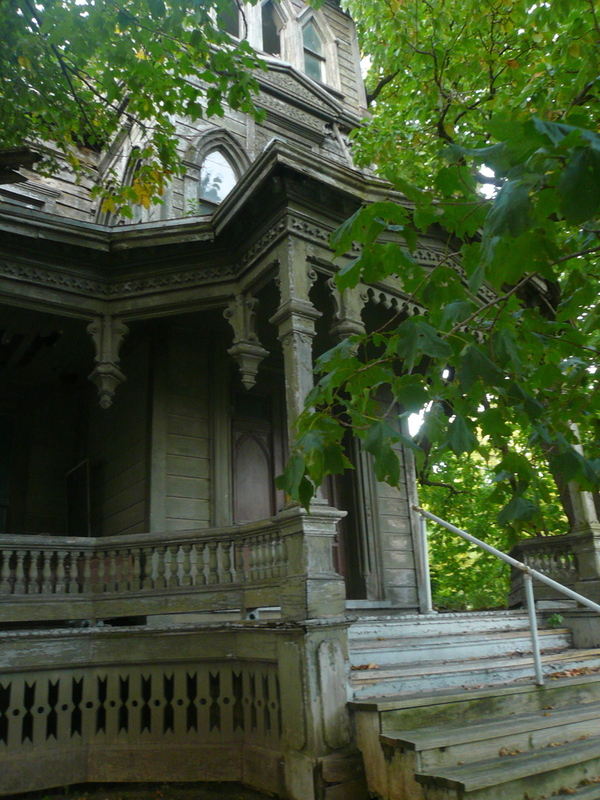 The poor old house was rotting apart. Gary pointed us toward a stone house in better condition. I had visions of old ghosts in this old town running through my head. 277 miles down the Erie Canal. We were up before the sun this morning at 6am! Time to get an early start…we’ve got to make it through this canal! As we motor endlessly on, the trees around us begin to change color. Fall certainly is beautiful on the canal. Today it cooled off significantly. From 90 to 60 in just one night. Talk about your crazy weather! Now it feels a little more like the end of September at least. 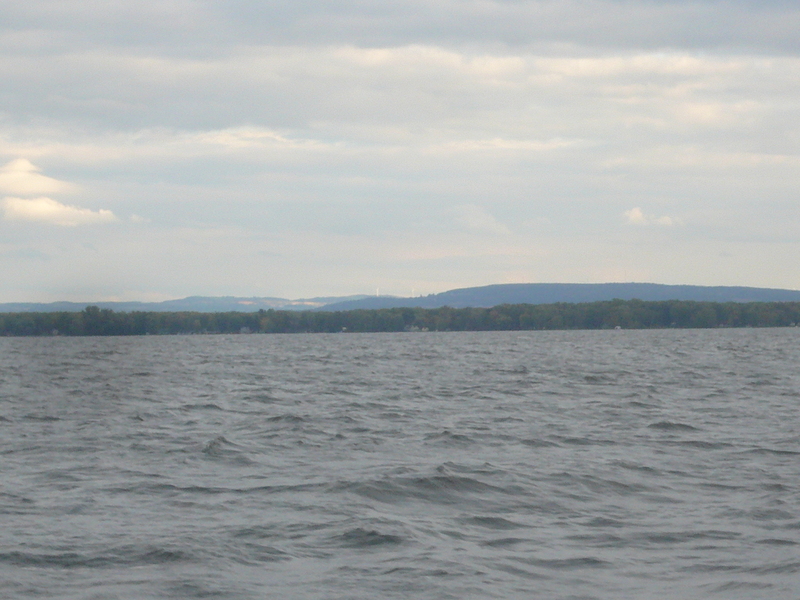 We made it across Lake Oneida today. It was strange to see such and expanse of water after seeing nothing but the canal walls. We were sad that the masts were down. No sailing for us, but we did see another ketch out on the lake taking advantage of the winds. 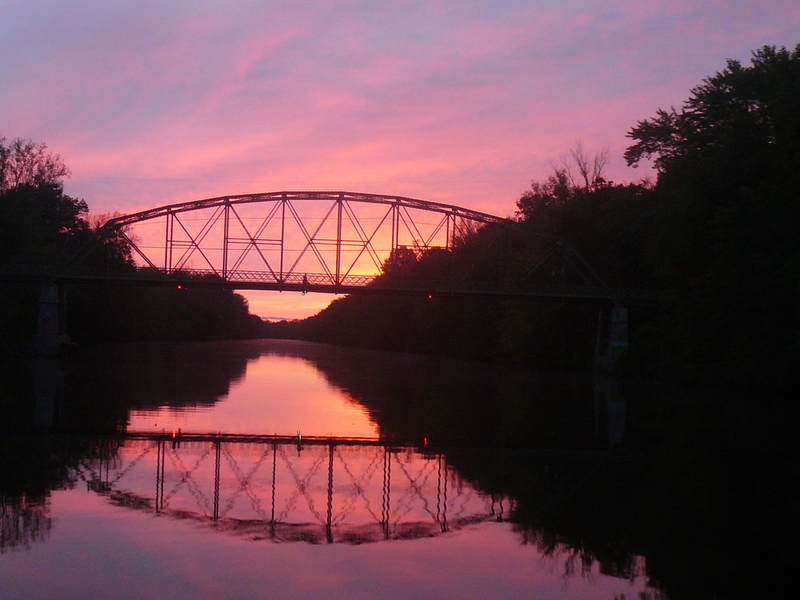 208 miles on the Erie Canal. We left Spencerport around 7am. The sun rose as we set off, making the sky turn shades of orange, yellow, and pink. The air was warm all around us. It was going to be a hot day! The heat pressed down upon us. The temperature rose near 90 degrees Fahrenheit! It felt like the middle of summer, so Kris and I made some lemonade. Yum! It was coolest down in the locks. We made it to Lyons by closing time. We explored the little town, riding the bikes and motor scooter around. Not too much to see, but there were some historic canal ships docked on the wall, and showers! After a hot, sticky day, there’s nothing better. 117 miles on the Erie Canal. 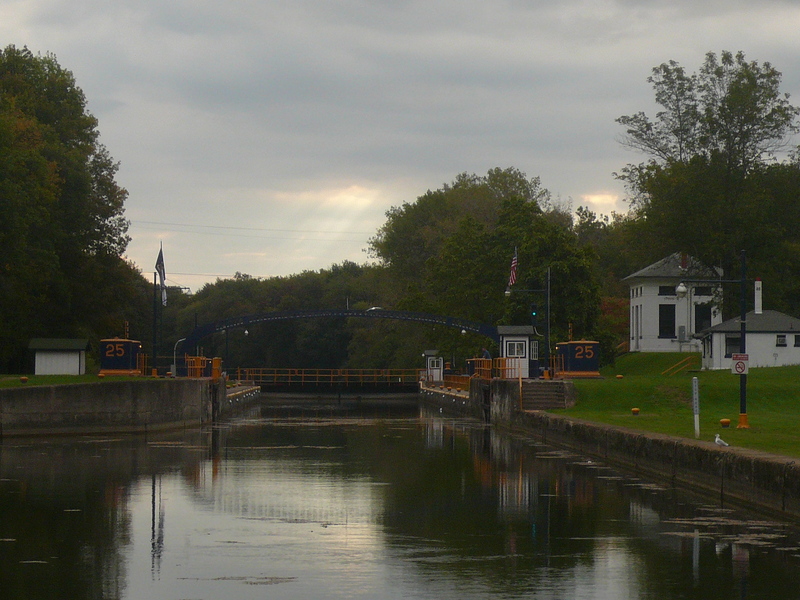 Waking up at about 7am this morning, we prepared to go through our first locks on the Erie Canal. Locks 35 and 34 are step canals, right in a row, enabling us to go down an otherwise very steep slope. Once through the locks, our day was spent moseying down the canal, traveling under bridges and calling lift bridges on the radio. Some bridge operators oversee several bridges in a stretch. One man had to drive 5 miles from one lift bridge to the next in order to operate the second one for us. We’ve put in for the night in Spencerport, NY. It’s a very cute little town. Kris and Emily road the bikes around town. We were able to pick up some groceries at Tops, wash some clothes at the laundromat, and take a gander at the lizards at the Reptile Guys! 67 miles down the Erie Canal. 9:00am…a light drizzle mists the air…time to take down the masts! A long process. Take down the booms. Wrap up the sails around the booms. Disconnect the electronics running through the masts. Strap the mizzen to the crane hook. Carefully loosen and disconnect the stays. Lift and direct, slowly. Lay down on the dock. Repeat for the main, adding disconnecting the genoa and the staysail. Lay the main on across the top of the cockpit and onto the mast cradle constructed the night before. Lay the mizzen next to it. Load on the booms and sails and plug up the holes. And voila, in a nutshell, there we have the recipe for an awkwardly shaped motor moat! We’re all set for the Erie Canal. Look out Sal, here we come! We left Wardell’s in good spirits. Deciding to get a head start on the canal, we headed down to Lockport. Passing under the low bridges gave everyone a weird chill down their spines. We shouldn’t fit under these! 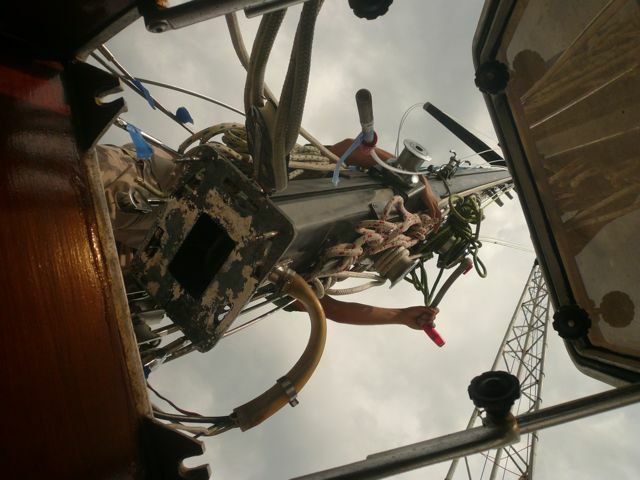 But now that the masts law down across the top of the boat, there was no problem. We put in at Lockport around 5pm. The lock worker was kind enough to let us dock next to the lock, in the water that they use to raise and lower the lock levels. 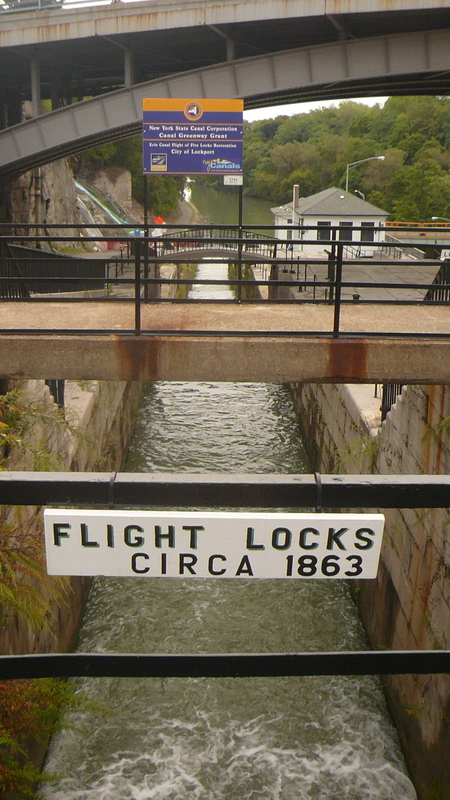 This gave us the opportunity to check out the stair step system of locks 34 and 35 of the Erie Canal. The old canal lay next to the new one, it’s doors removed and the water cascading down the locks in waterfalls. The lock goes down and impressive dispense. It’ll be an exciting first Erie lock to go through. 18 miles down the Erie Canal. We awoke early Monday morning. After a cup of coffee with friends and a final check to be sure everything was ship shape, it was time to set sail. With the winds coming in from the northeast, we prepared ourselves for a long motor across the lake. 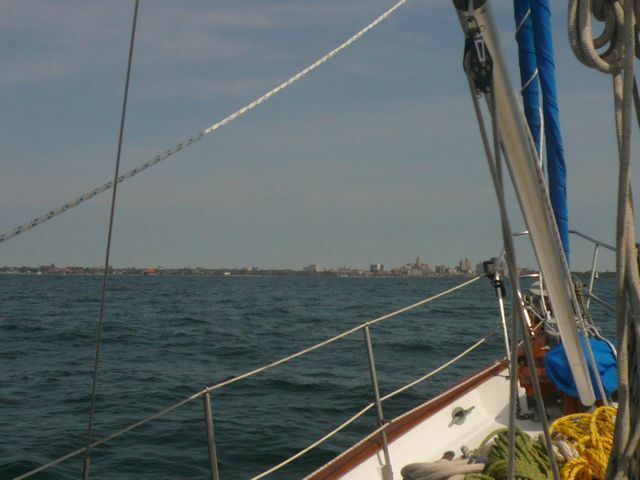 Our goal was to make it across Lake Erie in one go, 290 nautical miles nonstop. The lake was choppy with the wind and waves coming directly at the boat. We rocked up and down, up and down. The chop finally settled down around 6 o’clock and a nearly full moon rose to light the way. But the calm was not to last. The winds shifted slowly to the south, but this brought waves to us from the starboard side. Now the boat rocked side to side! We put up the staysail to steady us, but the incessant rocking continued. Just after dawn, we decided it was time to raise the rest of the sails. This steadied us a great deal, and we began to surf the unusually large lake waves. We road the wind and the waves into Buffalo around 1 o’clock Tuesday afternoon. We had made it! Everyone, especially Spinny, was relieved to take a break from our rocking and rolling and stretch our legs. We continued on down the Black Rock Canal, where we came upon our first lock. A new experience for us all, we had Kris scaling the outer lock wall, everyone looking around like fools, and a smaller sail boat passing us up. 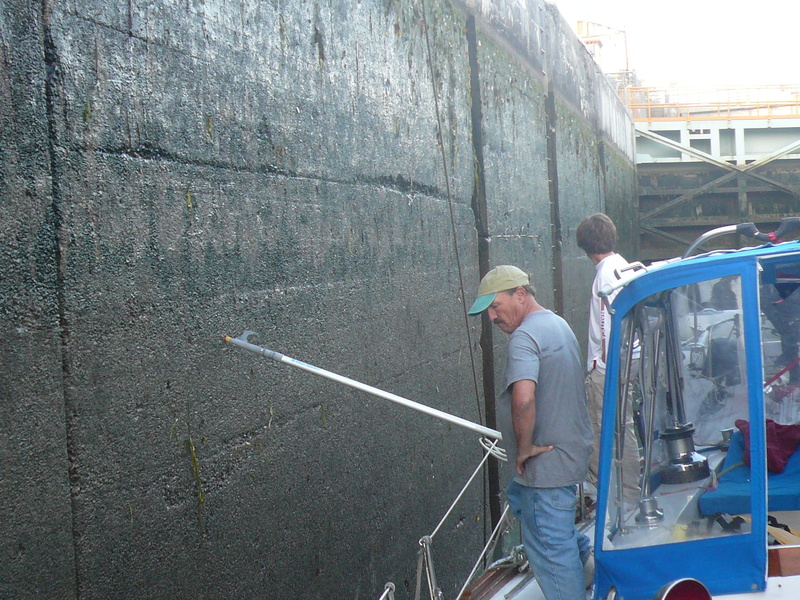 We made it into the lock and successfully conquered it, our hands slimy from gripping the lock wall lines. Now we’re rearing and ready for the locks of the Erie Canal. 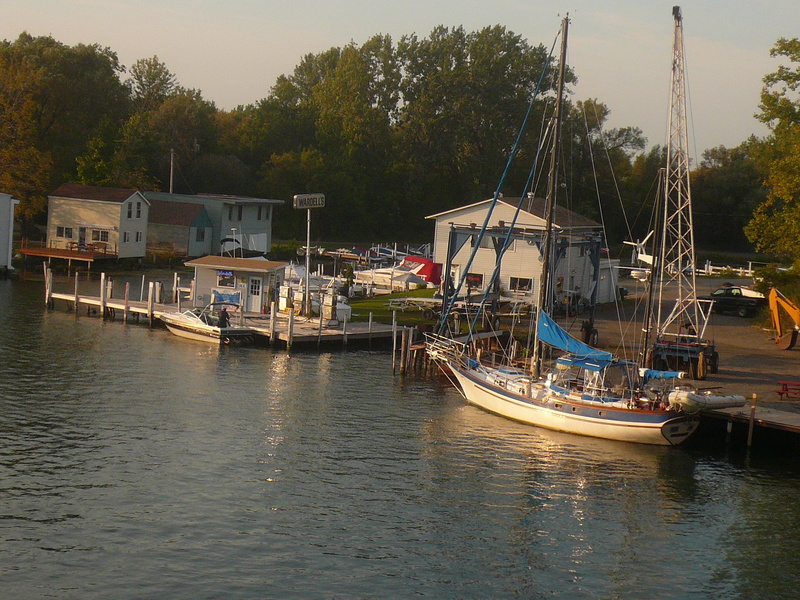 The second day came to a close when we pulled into the Wardel Boat Yard on the Niagara River. This is where our masts would be taken down in preparation for our adventure down the canal. After a walk and dinner in Tonawanda (apparently this is where the canal starts, not in Buffalo, as the famous song would suggest), we were all ready for a good night’s rest! After spending most of the summer preparing it is finally almost time to head off. We have decided to create this blog so that anyone interested can follow our progress. Stay tuned, more updates soon.